The previously released K78-500R3 series appealed to customers thanks to its compact size but high efficiency. 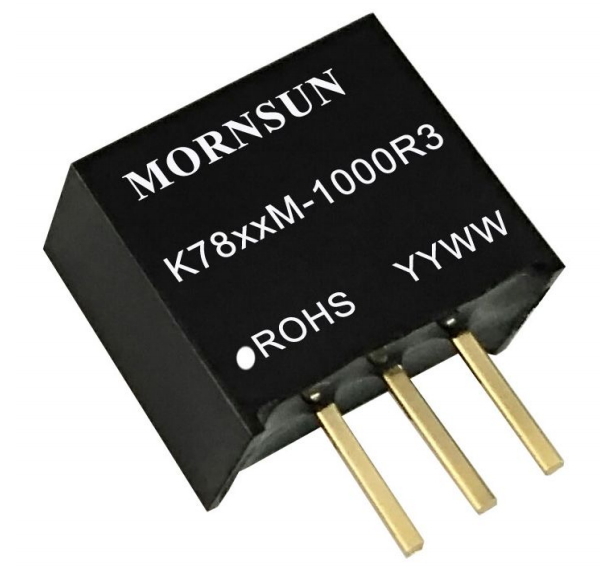 MORNSUN has expanded its new non-isolated switching regulator to include the K78xxM-1000R3 series to meet the market demand for 1A output. The new K78M-1000R3 series are full encapsulated in a compact 11.6 x 10.4 x 8 mm (0.457 x 0.409 x 0.315 inch) plastic case, compatible with K78-500R3 series. The series feature an ultra-wide input voltage range of 6-36V, continuous short-circuit protection & low ripple noise (typ. : 25mV) thus allowing Mornsun to target a diverse range of industrial control, grid power, instrumentation, mining and other related industries. The new 1A series can accommodate operating temperature from -40°C to +85°C and offer conversion efficiency up to 96% without a heat sink, which is the best alternative to traditional LM78xx linear regulators.